September 11th 2017 marks the 150th anniversary of the death of William Harbinson in Crumlin Road prison. On the evening of his death, Harbinson was found dead in his cell and the coroners inquiry heard he had an unexplained head wound but did not establish if it occurred prior to his death. The Head Centre of the Irish Republican Brotherhood in Belfast, Harbinson lived in the cottages known as Pinkerton Row just above the junction of North Queen Street and the New Lodge Road (roughly where Pinkerton Walk is today). Map of Belfast in 1860s showing North Queen Street, the Infantry Barracks (later Victoria Barracks) and the lower New Lodge Road. Pinkerton Row is unmarked appears to be the line of cottages just above ‘Trainfield’. The breaks in the houses on that side of the New Lodge Road roughly correspond to Bruslee Street, Carntall Street, Carnmoney Street and Pinkerton Street that all linked back to Artillery Street (which appears on the map as dotted lines). These streets were flattened in the 1960s and 1970s. The Half Bap and Little Italy districts extend from the bottom right of the map. Harbinson was a Staff Sergeant in the Antrim Rifles and had access to the Infantry Barracks arsenal. He was one of a number of ‘Fenians’ among the serving garrison in the barracks. The IRB had consciously inserted soldiers in the British Empire’s army and used them to both cultivate further recruits and bring back a quantum of military know-how and material to the organisation. In many respects this was an expression of the complex relationship between the Empire and its Irish subjects. Harbinson’s life is illustrative of how young men typically ended up in the British Army. Driven from his birthplace in Ballinderry to Liverpool at the height of the famine, he enlisted underage. Perhaps unsurprisingly, his army service was punctuated with bouts of ill-health. The year after Harbinsons death, James Connolly was born – brought in great poverty, he too enlisted underage in the British Army and was one of a number of those who participated in 1916 that had a military background. In Belfast in 1920-22, ex-servicemen were prominent in the ad hoc defence of districts that came under attack from unionists. Many of them became involved in the IRA. In the 1970s, again in the face of unionist violence, ex-servicemen (this time, formally) grouped themselves under the banner of the Catholic (later ‘Local’) Ex-Servicemen’s Association. So, in many respects, Harbinson reflects a tradition within republicanism that is often overlooked. James Connolly rationalised the motivation behind a young Irish man joining the British Army “…let him make the best of it and learn all he can and put his training to the best advantage he can when he comes out. A well-trained soldier will always find his allotted place in the community”. Harbinson also reflects a largely unexplored aspect of republican tradition across north Belfast. In some respects, like Harbinson, this is connected to the presence of the Infantry Barracks and Irish soldiers serving there. But he is far from the only senior IRB figure to have lived in the north of the city. Frank Roney, Head of Centre in Belfast before Harbinson, was from Carrickhill. Robert Johnston served on the Supreme Council from the 1860s, FJ Biggar was co-opted onto the Supreme Council by the end of 1870s. Henry Dobbyn was also prominent in the IRB. That generation was slowly eased out and replaced by the likes of Denis McCullough (President of the IRB’s Supreme Council in 1916). All lived in the north of the city, on of around North Queen Street or the Antrim Road. Johnston was the father of Eithne Carbery, the pre-eminent poet of the nationalist revival of the late 19th century and editor of the Shan Van Vocht newspaper. Her brother, James and cousin James were also active in the IRB (the likes of Major John McBride were also connected to north Belfast through St Malachy’s College). Another Antrim Road resident, Winifred Carbery, was Connolly’s assistant throughout the Easter Rising. So, on the 150th anniversary of his death, it is worth remembering how William Harbinson reflects many aspects of republican history in north Belfast (and further afield) that really should warrant further exploration in the future. In July 1867 Belfast IRB leader William Harbinson was brought up on charges of treason felony. He died in Belfast prison in September 1867 before he was brought to trial. While his name was given to the original republican plot in Milltown and his funeral was attended by over 40,000 people (in defiance of opposition from the Catholic clergy), I suspect relatively few people have heard of him. Photograph of William Harbinson from 1867. In an attempt to build intelligence on the IRB, the authorities photographed arrested leaders, which was very innovative for the time. 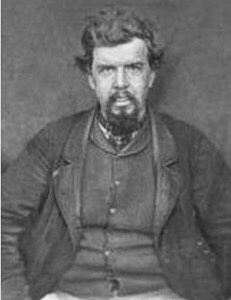 The photograph of William Harbinson was first reproduced by Joe Graham in Rushlight. The Irish Republican Brotherhood was founded in 1858 to establish Ireland as an independent democratic republic. In the United States, there was a parallel American organisation, known as the Fenian Brotherhood which tended to give its name (Fenians) to the wider movement. The outbreak of the American Civil War stalled the development of the Fenians. The support given by the Anglo-Irish aristocracy, Orange Order and the wealthy to the confederacy and slave owners energised the IRB in Ireland, inspiring the likes of Frank Roney, from Carrickhill, to be sworn into the IRB by 1862. Roney was to be the first Belfast and Ulster Head Centre. Like Robert Johnston, who was to replace Roney on the Supreme Council of the IRB by the start of the 1870s, Roney met and knew some United Irishmen who had been active in 1798 (Johnston was 99 when he died in 1937). At local level, the IRB was formed into units of ten volunteers, whose leader was called a ‘centre’. At county or district level (referred to as a ‘Circle’), a ‘Head Centre’ was elected by a convention of the centres. The organisation was governed by an eleven member Supreme Council, seven electoral divisions (four provinces of Ireland, Scotland, North and South England) each returned a member at a convention at which a divisional committee of five was also elected. While the IRB was a clandestine organisation, its Supreme Council met in Dublin and some records of its meetings survive (see here). Some modern historians dispute the scale and nature of the IRB in Belfast, but contemporaries like Jeremiah O’Donovan Rossa and John Devoy were complimentary of the work done in Belfast. The authorities also seemed similarly impressed as, when arrests began, the proportion of suspects detained in Belfast was on a par with other centres of IRB activity like Dublin, Cork and Tipperary. In Belfast, the IRB had revealed itself in response to Orange Order violence in August 1864. It recruited many soldiers, including William Harbinson, a staff sergeant in the Antrim Rifles who had access to the arsenal of weapons held in the barracks in Belfast. Soldiers also drilled and trained other IRB volunteers in Belfast. This allowed the IRB to prepare for an insurrection. After the American Civil War ended in 1865, it actively recruited veterans and collected weapons, intending they also be available for any uprising in Ireland. William Harbinson was born in Ballinderry in 1832 (in 1867 his age is mistakenly given in newspaper accounts as 41 or 44). His father, John Harbinson, may be the same one who is recorded living in Portmore in Griffiths Valuation in the 1850s. He was underage when he joined the 39th Foot Regiment in Liverpool, undoubtedly fleeing the famine, in February 1847. Ballinderry lost a sixth of its population during the famine. The Northern Whig had referred to the famine, in the previous month, as ‘the present favourable crisis … for conveying the light of the Gospels to the darkened minds of the Roman Catholic peasantry’. After a slump in the linen industry, as well as potato blight impacting on Antrim in late 1846, January 1847 had saw overt attempts to Catholics to convert to Protestantism in return for famine relief. The rate of fatalities during the famine rapidly increased in 1847 year. Exposure to the famine may have left its mark on Harbinson, as he was discharged from the army as unfit for service, due to ill health, in May 1852, from when he was pensioned until July 1853. At the time of his marriage to Catherine McClenaghan in St Patrick’s, Donegall Street, in April 1857, he was working as a labourer and living in Wesley Place, while Catherine was living in Inkerman Terrace, both close to what is now Shaftesbury Square. William and Catherine appear to have had one child, a son, William John, who was born in October 1859 but died young (he was baptised in St Malachys, suggesting they were still living close to the Markets). His brother Philip, who also to be prominent in the IRB, moved to North Queen Street. William returned to the army serving in a local militia regiment, the Antrim Rifles, where he rose to the rank of colour sergeant. In 1864, the Belfast Morning News reported that he was presented by a valuable gold watch and chain by the non-commissioned officers and privates of K Company of the Antrim Rifles, in John Edgars bar in John Street on Thursday 11th August. Oddly, that episode occurred during the bloody riots that began on the evening of the previous Monday, with the Pound, and John Street, at the epi-centre of the violence. That was the same year Harbinson was recruited into the IRB. By late 1865, the British government closed down The Irish People, the IRB newspaper founded in Dublin in 1863, and arrested staff including Jeremiah O’Donovan Rossa. A few months later, it suspended Habeas Corpus to legalise the arrest and detention without trial of suspected IRB members and sympathisers (a process that would later be more familiar to people as ‘internment’). In early 1866, it began to utilise those powers to stage a number of arrests in Belfast, beginning with Michael McGonigal on the 19th February, the next day Frank Roney (apparently using the surname O’Neill) was arrested at a pub at the junction of Peter’s Hill and the Old Lodge Road owned by Gordon O’Neill. Others arrested that day included John O’Rorke, a pensioner with a wooden leg who had a barbers shop in Millfield, Patrick Hassan (of the 83th New York Irish Volunteers) and Harbinson. Roney and Harbinson were imprisoned in Crumlin Road and Mountjoy, although both were eventually regain their freedom due to public pressure for the general release of republican prisoners and letters of support from their family and prominent individuals. Harbinson was released in September and Roney in November. Harbinson appears to have taken over as Head Centre in Belfast. Roney remained on the Supreme Council, travelling to Paris and London on IRB business. Early in 1867, Harbinson also travelled to London. It was later alleged by an informer, John Massey, that Harbinson represented Ulster at a meeting of the Supreme Council in February 1867 (see The Nation, 7th December 1867). On Thursday 7th March, Harbinson was arrested at his house in Pinkertons Row, just off North Queen Street. The police had been watching the house the previous night and raided the house immediately once Harbinson’s wife, Catherine, had opened the window shutters at 7 am on the Thursday morning. Harbinson was still in bed and another IRB volunteer, John Murray, was found in the kitchen of the house. Harbinson was held by the police while Murray was taken to Banbridge. It was alleged in the press (from Monday 11th March – see likes of The Examiner) that Harbinson had taken over as Belfast Head Centre from Roney. The newspapers claimed there were six Centres in Belfast who had all observed the security protocols meaning that it had been difficult to penetrate the IRB with informers. This bit of information was possibly a cover for John Murray, who had been arrested on 14th February, remanded, then released. Murray was to give evidence against Harbinson and others at a remand hearing in court in mid-July. After his arrest Harbinson was held under the Habeas Corpus Suspension Act in Crumlin Road then sent to Mountjoy. He was returned to Crumlin Road on 24th May, presumably with the intention of bringing charges against him and other IRB leaders that had been arrested in Belfast including the likes of his brother Philip and Francis Rea. William Harbinson was brought to court for an ‘investigation’ along with Edward Gilmore, Patrick Keith and Richard Lavery on 13th July. By the end of the month, a treason felony charge was brought against Harbinson in front of a Grand Jury which found that he would have to stand trial. The trial was to take place at the Spring Assizes in March 1868. In prison, Harbinson and the other interned IRB suspects were able to have their food brought in to them rather than eat the prison diet. They also were not forced to do prison work and were permitted frequent exercise, association, books and tobacco (this is what would later be classed as political status). On the night of Monday 9th September, William Harbinson was found dead in his cell in Crumlin Road during the 9 o’clock check by staff. An attempt to hold an inquest the next day was delayed until his brother Philip (who was also imprisoned) and father-in-law, Edward McClenaghan, could attend. At the inquest, the prison governor’s evidence stated that he always thought Harbinson was of ‘delicate’ appearance, although neither he, Catherine Harbinson nor his lawyer had made any complaint about his health. The inquest heard from prison staff that he had been outside exercising for around four hours that day and returned to his cell at either two o’clock or four o’clock and was last reported at quarter to six as sitting reading on his bed. When found, he was lying undressed on the floor as if he had fallen out of bed, although staff reported that there were no marks on his body. The inquest found he had died of disease of the heart and it was officially recorded as the bursting of aneurism aorta and he had been delicate a considerable time. This may have been the same condition which had led to his discharge from the army in 1852 and may have had its roots in damage done to his health by the famine. While the Catholic hierarchy had been trying to counteract the rise of the IRB, it found it impossible to limit Harbinson’s funeral. On Sunday 15th September, round 40,000 people are believed to have either watched or taken part in the procession, which began in North Queen Street and carried the remains to Laloo, in Ballinderry. It travelled via Donegall Street, Bridge Street, High Street, Castle Place and the Pound to the Falls Road. The original republican memorial erected in Milltown in 1912 was named the Harbinson Plot in his honour. Harbinson’s funeral was to be the largest republican event held in Belfast until Bobby Sands funeral in 1981. You can read more accounts of the funeral and Harbinson on Joe Graham’s Rushlight webpages. This year sees the 150th anniversary of the proclamation of an Irish Republic by a provisional government of the Irish Republican Brotherhood, popularly known as the Fenians. 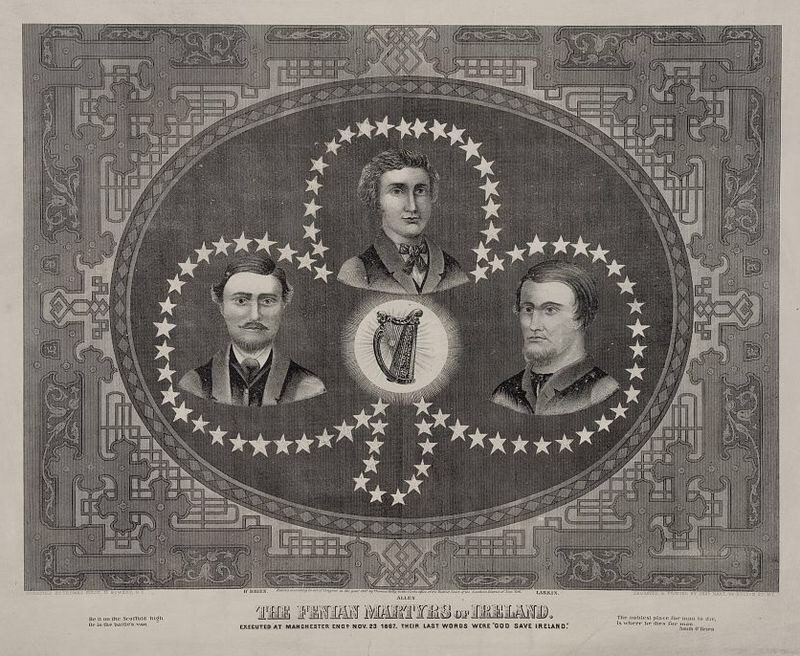 It also marks the 150th anniversary of the execution of the Manchester Martyrs, which was to attain great significance among republicans until 1916 and who are commemorated in the song ‘God Save Ireland’. We have suffered centuries of outrage, enforced poverty, and bitter misery. Our rights and liberties have been trampled on by an alien aristocracy, who treating us as foes, usurped our lands, and drew away from our unfortunate country all material riches. The real owners of the soil were removed to make room for cattle, and driven across the ocean to seek the means of living, and the political rights denied to them at home, while our men of thought and action were condemned to loss of life and liberty. But we never lost the memory and hope of a national existence. We appealed in vain to the reason and sense of justice of the dominant powers. Our mildest remonstrance’s were met with sneers and contempt. Our appeals to arms were always unsuccessful. We appeal to the Highest Tribunal for evidence of the justness of our cause. History bears testimony to the integrity of our sufferings, and we declare, in the face of our brethren, that we intend no war against the people of England – our war is against the aristocratic locusts, whether English or Irish, who have eaten the verdure of our ﬁelds – against the aristocratic leeches who drain alike our ﬁelds and theirs. Republicans of the entire world, our cause is your cause. Our enemy is your enemy. Let your hearts be with us. As for you, workmen of England, it is not only your hearts we wish, but your arms. Remember the starvation and degradation brought to your ﬁresides by the oppression of labour. Remember the past, look well to the future, and avenge yourselves by giving liberty to your children in the coming struggle for human liberty. Next year brings yet another anniversary, the 150th anniversary of the proclamation of an Irish Republic by a provisional government of the Irish Republican Brotherhood, popularly known as the Fenians. It seems somewhat appropriate given the failure to deliver on the aspirations of their 1867 proclamation, or that of 1916, that the two anniversaries are bridged by citizens occupying a state owned building in the cause of providing basic shelter and food for those less well off, while the state itself seeks to evict its own citizens and force them out to sleep in the open in December. We appealed in vain to the reason and sense of justice of the dominant powers. Our mildest remonstrance’s were met with sneers and contempt. Remember the starvation and degradation brought to your ﬁresides by the oppression of labour. Remember the past, look well to the future, and avenge yourselves by giving liberty to your children in the coming struggle for human liberty. “Our mildest remonstrance’s were met with sneers and contempt.” The irony of this phrase is that those sneers and contempt were from the British Empire of 1867, not an ‘Irish’ government and establishment in 2016.